A white sleeper bed with desk & storage. The Leo White Sleeper is an attractive bed for your child that provides a safe, comfortable area for them to both sleep and play in. This children's bed has a white finish with a warm, soft colour tone and will last for years without showing signs of wear. This bed also benefits from two side storage drawers, a pull out study desk and a built in ladder for easy access making The Leo White Sleeper a practical & versatile children's bed. Delivered flat pack - assembly options available - please call for details. This bed takes a single 3'(90 x 190 cm) UK sized mattresses which is NOT included, for safety reasons the mattress should be no thicker than 17.75 cm/7", see our bunk bed mattress for a suitable mattress for this bed. 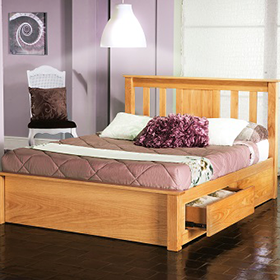 This bed can be used with the Domino white matte bedroom furniture and is also available to order in a maple finish.